You'll love what these bikers do for infants whose mothers can't provide them with breast milk. Talk about badass: A team of New York City bikers has teamed up with the New York Milk Bank to deliver breast milk to babies in need, and we couldn't love the mission more. The idea came to the milk bank's executive director, Julie Bouchet-Horwitz, when she was sitting in traffic, according to a report from The Huffington Post. Bouchet-Horwitz noticed a pack of bikers making their way through the thick city traffic, and it made her recall things she had heard about London bikers who deliver blood and milk to people in need. 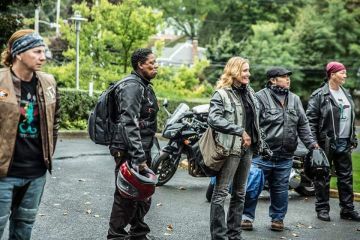 Bouchet-Horwitz found the Sirens Women's Motorcycle Club of New York City after searching for a group of bikers, and the Sirens unanimously accepted her proposition. The two groups have established a really wonderful partnership: Bikers pick up breast milk from designated deposit sites—all donors must go through screening before they can drop off—and the milk is frozen until it's time for bikers to take it to babies who don't have access to breast milk. This could be a lifesaver (literally) for babies of adoptive parents, moms who are undergoing surgery, those who can't breastfeed for health reasons, and those who are separated from their mothers. The New York Milk Bank was founded based on the mission of providing safe human milk to babies who need it, and this partnership represents a smart, efficient way for the group to do just that. The milk bank, which is just a few months old, saw the Sirens (who are led by president Jen Baquial) as the perfect team to partner with—in part because it's a group full of women.